Subject to availability. Please contact us for more information. 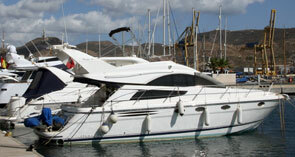 With the exception of special conditions or dimensions (to be determined by Yacht Port Cartagena). * Not applicable to multihulls. VAT, T5 tax and B0 tax not included. Monthly fees shall be payable in advance. Free Wi-Fi internet access for boats on “LONG STAY RATE” and only for two devices. Free parking space for one vehicle. Taxes and supplies price increases to be applied at the same moment and in the same quantity as done by corresponding authorities and company suppliers.